ArcGIS Pro has a variety of utility network tools to help you create, configure, and work with your utility network system. You can access utility network tools and commands, network properties, and dirty areas through the utility network layer. This topic will help you get started working with a utility network and become familiar with its suite of functionality. If you are unfamiliar with any of the terminology used here, see Utility network vocabulary and Structure of a utility network for more information. To create a utility network, use the Create Utility Network geoprocessing tool. This tool creates the utility network layer and the structure domain network feature classes that will be shared across different domain networks. After creation, additional configuration is needed to prepare the utility network for use. For more information about creating and configuring a utility network, see Utility network creation and configuration. When a utility network is created, a utility network dataset is generated with the name specified. This name represents part of the fully qualified name for the utility network when viewed in the Catalog pane. When added to an active map, the layer provides access to the Utility Network Data tab, network properties, error features, and dirty areas. The layer name shown in the Contents pane is the utility network name + Utility Network. For example, EsriCoOp Utility Network. 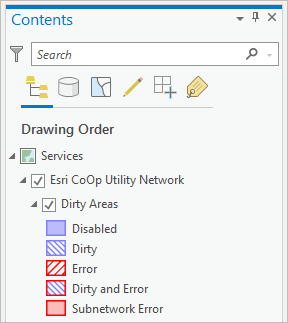 Under the Utility Network tab, the Data tab becomes available when you add a utility network to a map. This tab contains tools and commands that are most commonly used in utility network workflows. 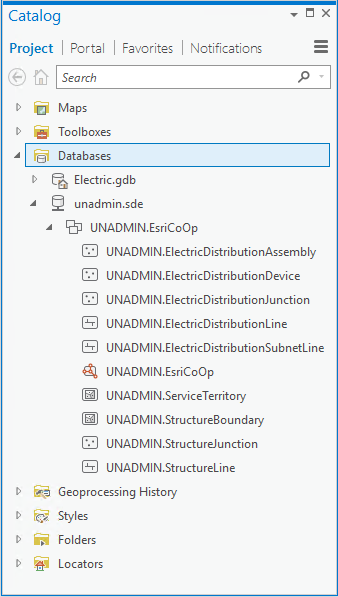 There is also a Utility Network toolbox containing all the geoprocessing tools pertaining to the utility network for individual use, modeling, and scripting purposes. These tools can be accessed via the Analysis tab in the Geoprocessing group. There is a variety of tools and commands under the Utility Network tab, on the Data, tab that allow you to work with the network topology, associations, tracing, and network diagrams, and perform subnetwork management tasks. The Data tab includes commands to create new network diagrams, find existing diagrams, and overwrite or append features to opened diagrams. 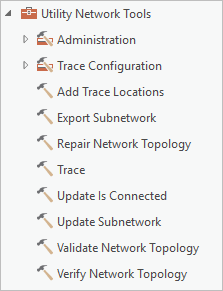 The more specific network diagrams, commands, and tools are grouped on the Network Diagram tab. This is a contextual tab that becomes available when you create a new diagram or open an existing diagram. The Utility Network toolbox contains a number of tools that can be used to create and manage the utility network layer, subnetworks, associations, the network topology, tracing, diagrams, and rules. Some of these tools can also be accessed from the Utility Network and Network Diagram tabs as described previously.